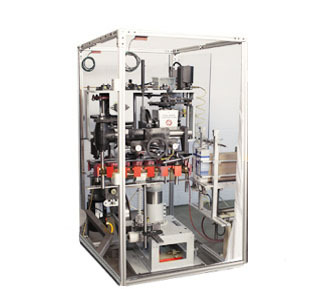 The Model 18 spout inserting machine integrates with any packaging system and can be customized for left- and right-handed configurations. The Model 18 automatically opens folded cartons and inserts pour spouts into any size carton; it is designed to operate at up to 130 units per minute. The machine inserts paper spouts, plastic spouts, metal spouts and aluminum spouts. The spout inserting machine integrates with vertical cartoners, food packaging machinery, and filling systems from: Clybourn Cartoner, Yeaman Machine Technologies, Triangle Package Machinery Co., Tisma, ACMA and many more.